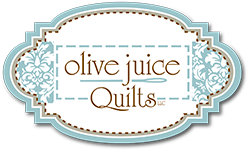 Olive Juice Quilts offers high quality Long Arm Quilting Services in a variety of creative quilting options and competitive price structures. With our state of the art Statler Stitcher, we provide many quilting designs. We use only the finest quality quilting threads on our long arm machine. Choose from a large variety of colors from our stock thread, which is included in your quilting price. Our goal is to finish your quilt as promptly as possible, without sacrificing quality. Turn around times for “overall” quilting is typically 6 weeks. If you need your quilt by a specific date, please be sure to let us know so we can get it back to you on time! We offer a rush fee option, if you'd like to expedite the quilting process. Please note that the holiday season requires a longer turn around time. We offer several different batting options. Hobbs 80/20 is our most popular, but we also offer wool batting, Polydown Plus batting, and Warm & White batting. If you'd like to supply your own batting, just let us know! With our Statler Stitcher, we can offer many different designs, both computerized and hand guided. Please remember to leave your backing fabric 4″ larger on all sides. This means your backing will be 8″-10″ wider and longer than your quilt top. To get square inches, measure the quilt width and length. Take quilt width and multiply that by the quilt length.